Elgin Ridge is owned by Brian and Marion Smith, he attending to winemaking and she to the vineyards, the “MV” designation of this maiden vintage Méthode Cap Classique standing for “Marion’s Vineyards”. 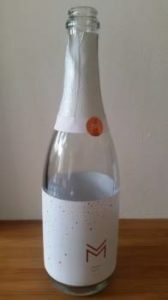 The Elgin Ridge wines taste wonderfully idiosyncratic, none more so than this bubbly. A blend of 83% Pinot Noir and 17% Chardonnay, it was matured for two years in old oak before three years in bottle and features zero dosage. Onion-skin in colour, the nose shows raspberry, strawberry and a little earthiness. It’s rich to the point of chunky on the palate but this offset by fresh acidity and the mousse is suitably fine. It’s not exactly classical but it has plenty of character. Price: R500 a bottle.